When applying green concealer, many makeup artists use a concealer brush. Of all the cosmetic concealer colors, green concealer may seem like the most absurd, but it can color red blemishes very well. You should only use a small amount of this concealer, however, since using too much can make your face look green. To apply the concealer, gently dab it on your face. You should then cover it with a flesh-colored concealer for a more natural look, and powder can be used to set it. Different types of concealers are used to cover different types of blemishes. Green concealer can be used to make red blemishes, like pimples, less noticeable. Other concealer colors are available as well, and each of these can be used to cover blemishes of a certain color. Yellow concealer and salmon concealer can both be used to cover blue or purple blemishes. It is also important to choose a green concealer that has the same undertones as your skin. If you have cool undertones, choose a concealer with blue undertones. On the other hand, if you have warm undertones, choose a concealer with a hint of yellow. Green concealer should only be applied where it is needed. If it is applied to an area of your face that is not red, you may look green and appear sickly. A green primer can be used in place of a green concealer, if your face is very red or blotchy. When you apply green concealer, just use a tiny bit. A small amount of this type of concealer can go a long way. If more is needed, you can add a little more as needed. To apply this concealer, many makeup artists recommend using a concealer brush. If the blemish that you are trying to cover is very small, like a pimple, you can use a pointed brush. You can also use your finger or a makeup sponge to apply a green concealer. Gently dab the green concealer on the blemish you want to cover. It should then be blended into the surrounding skin. This will help create a more natural look. 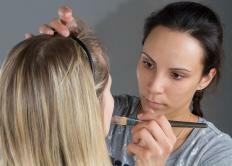 Makeup experts advise applying a flesh-colored concealer over the green concealer. This concealer should match the color of your skin. Like the green concealers, it can be applied with a concealer brush, makeup sponge, or finger. It should then be blended into the surrounding skin. You can also apply a foundation on your whole face. This will help even your skin tone and create a natural look. To keep the makeup from running or rubbing off, a light layer of translucent powder should be applied to your face with a large brush. How Do I Use Salmon Concealer? How Do I Choose the Best Concealer Brushes? How Do I Choose the Best Blemish Concealer? How Do I Choose the Best Natural Concealer?